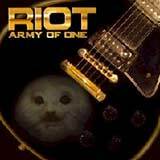 Riot is back with their thirteenth studio album, Army of One. Quietly enough, Riot has evolved into quite a consistent band over the past 13 years. After the band parted with original vocalist Guy Speranza (his religious beliefs conflicted with the RnR lifestyle of the time) following their Fire Down Under album, Riot resurfaced under many different incarnations. The band became a sort of "Mark Reale and Friends" band with all the turnover. Ever since 1993's Nightbreaker album, the lineup has been steady. Frank Gilchriest is the band's fourth drummer in that time period, but all other spots in the band have been the same since 1993. With that being said, Riot has carved themselves a very reliable and high quality style of heavy metal over the past few years. While Riot will never duplicate their early 80's popularity in the United States, the band remains insanely popular in Japan. Some fans of the band surely prefer certain albums over others, the Mike DiMeo era has produced nothing less than very good to outstanding albums since Nightbreaker. Army of One is another solid slab of Riot heavy metal to add the band's history as Riot approaches its 30th anniversary. After many listens, I can say that Army of One rivals Inishmore as my favorite DiMeo era Riot album. Army of One contains a small number of speed metal tracks similar to the Thundersteel era of the band, but the majority of the album falls under the hard rocking / melodic metal sound of the early years of the band, with a nice dose of Nightbreaker thrown in. As I said before, Riot is immensely popular in Japan, and so the speed metalfest of the title track is the perfect opening track. The Japanese can't get enough of these tracks, and so this track is nod to the loyal fans in the Land of the Rising Sun. From there, things calm down into the traditional melodic metal that really grabs you. Helpin' Hand rounds out the first half of the album as the semi ballad of the album. It's nothing special, especially after the magnificent first few songs of the album. Unlike the early years of Riot, the production is slick, maybe a bit too slick in spots such that some bite is lost. Also, some light keyboard textures are sprinkled here and there on the album. Fortunately, they don't bloat any of the songs, but instead add some well placed atmosphere and emotion when need. Tony brought in Bruno Ravel from his other band Westworld (and of Danger Danger) to help on keys for this album. Also of note, Tony Harnell, also of Westworld (and formerly of TNT) again lends some backing vocals on this album. Continuing on with the album, another speedster picks up the second half of the album where Helpin' Hand left off. While The Mystic does sound a bit familiar (Kings are Falling / Wings of Life), it's still a great song with lots of attitude and energy. Reale shows off some his best licks during this track. From here, Riot again brings out it's more melodic side with Still Alive, and the old school, gritty Rhett Forrester style Still Alive in the City. Shine is next, and it combines the best of both worlds with some very melodic guitar work placed over charging drum work. An instrumental track follows, which I skip. Sure, it shows off Reale's impressive guitar talents, but at the eleventh spot on the album, it might as well have been placed last as to not disrupt the flow of the album. Darker Shade of Light and a live version of Road Racin' (Japanese release) round out the album. The former is an excellent track, especially given its placement on the album. There's a lot of Fire Down Under sounding guitar work from Reale, and DiMeo's soulful vocal delivery sounds so much like the early years of the band. Army of One is everything I could have expected from Riot in 2006. With the stability of their lineup over the past 13 years, Riot have developed a solid and reliable sound, but have managed not to become stale at the same time. With certainty, Army of One is one of the stronger moments of the DiMeo era. It's amazing that this band was left for dead after the Born in America album, but has gone one to become a steady and solid contributor to US heavy metal. Army of One is a traditional heavy metal album of 2006 that should not be missed! * Note: Riot has signed a deal with Metal Heaven Records in Germany, and an October 2006 release in Europe is in the works.